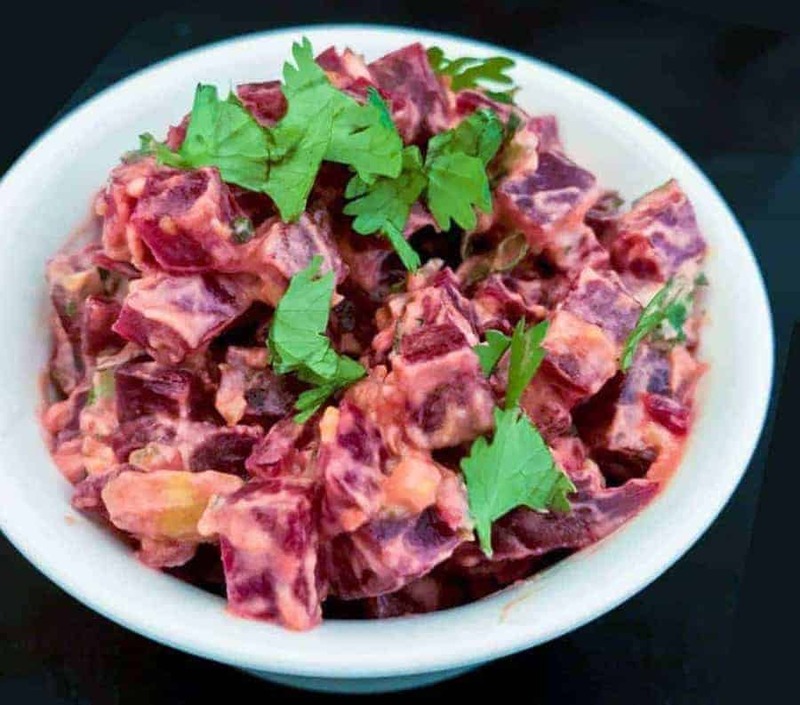 Not everyone loves beets, and I don’t know that I could just chow down on an entire cooked beet by itself, but if you like beets, there aren’t always that many recipes for them floating around. 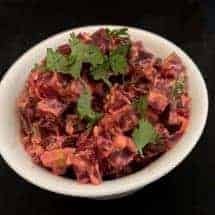 This is a classic cold dish that we make in India, and it’s been a while since we made it so I thought I’d try it, especially since having an Instant Pot makes it so easy to cook the beets. I cooked them the night before and decided to just leave them in the fridge but they were so easy to peel once they were cooked, even when they were cold. I want to show you a slight variation on this salad as well. I’ve used yogurt for a slightly acidic/souring effect in this dish. You can omit the yogurt and use either lemon juice or chopped tomatoes instead. It’s a nice change and actually, it gives you a brighter colored salad, which makes it pretty on a summer lunch table. 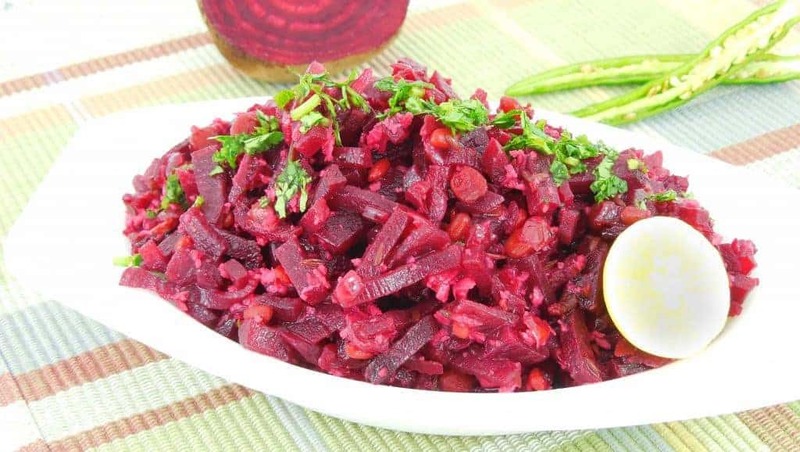 You just need a few common ingredients for this very simple Indian Beetroot salad. 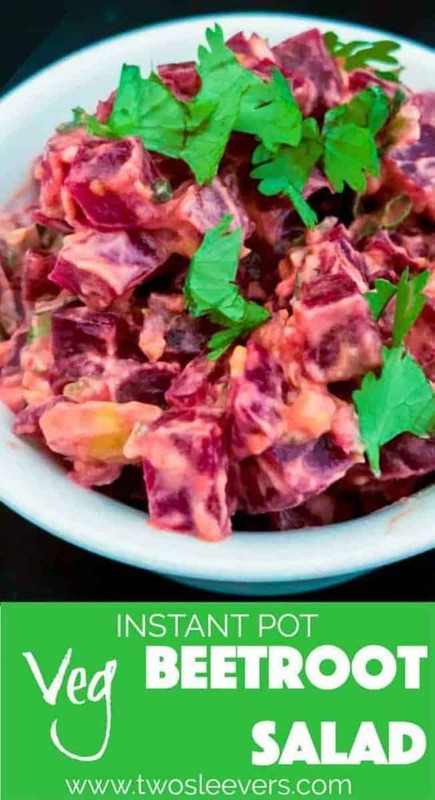 Place 1 cup of water into your Instant Pot. Cut the beets in half and place on a steamer basket or on a trivet. Cook them for 12 minutes, using NPR (Natural Pressure Release). Allow the cooked beets to cool before trying to peel, but once they're cool the peel will just slide off. Dice them into even pieces, and combined all the other ingredients except the items for tempering. Heat up the oil and when it starts to shimmer, put in the cumin and mustard. If you don't have mustard seeds, that's fine just double up on the cumin seeds. Once they the seeds start to sputter, turn off the heat and put in the turmeric, allowing it to cook and flavor the oil. 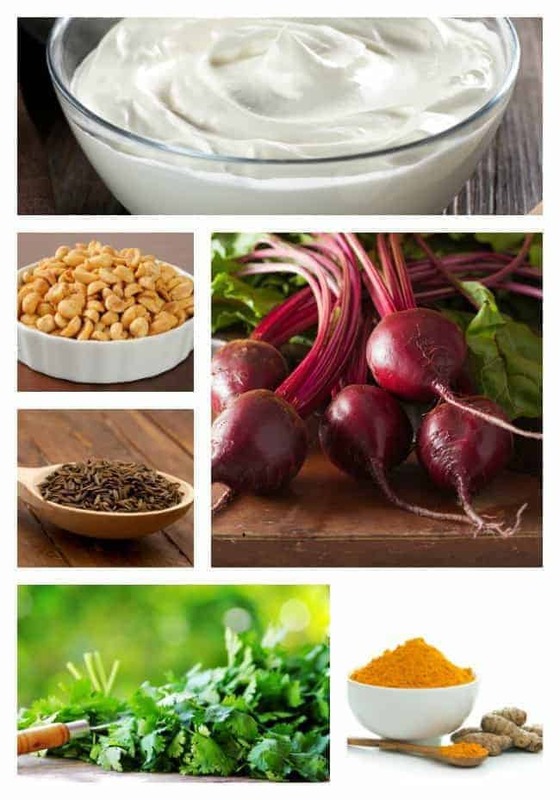 Carefully pour this over your chopped ingredients, and mix it together. Feel free to omit the cilantro if you hate it, or substitute with parsley. This is one of my very favorite recipes. It’s incredibly satisfying and tasty. I would add green chilis to the tadka for this one. I can’t wait to try this. Can I use parsley in stead of the cilantro? Also, are the mustard seed you use, black or yellow? Yes to parsley. I use black ones but either would do.